Work Habits - sitting for extended periods of time without changing position is hard on your whole body and is a factor in developing RSI. Don't ignore the early warning signs, such as weakness of your grip, numbness, and discomfort or pain in the arms, hands, wrists or shoulders. Early diagnosis and treatment are vital to ensure recovery from the symptoms of RSI. Stretch - Include regular stretching into your work routine. Every 20 to 60 minutes, do three or four stretches - for hands, shoulders, neck and trunk. The key is to move your joints through their normal range of motion. Inquire about computer software that is set to interrupt work at chosen intervals with appropriate stretches, or set your onscreen timer to remind you to take "micro-breaks" as needed to momentarily change your arm position or to shift your weight. You can find some great "Exercise Breaks" at www.computerfit.com. Move - Get up from your workstation for a short stretch or walk around to promote blood flow to fatigued muscles every hour. No one has ever become more fit by sitting at a desk. Get regular daily exercise, away from the computer. It could be as simple as a walk around the office or getting off the elevator one floor early and taking the stairs. Move out of the pattern that the work is creating (i.e. stretch the opposite motion). Ensure you are not putting pressure on the carpal tunnel; slow key strokes to allow the median nerve to move off the tendons. Add it up - Add variety to your tasks. Take every break as an opportunity to go for a short walk and stretch. Keep track of activity and build up to 30 minutes of stretching and exercise every day. Vary your tasks (keyboarding, filing, telephone, reading documents, etc.). Adjust your chair, as below, to support your back and minimize awkward postures that can lead to muscle tension, fatigue and soreness. Avoid slouching. Use a good quality mouse that requires minimal pressure to click, and be sure to position it on the same level and as close to the keyboard as possible. Keep your wrist straight and move the mouse with whole arm movements. If you're working on a computer all day at work, you may want to limit your computer-time at home. Choose activities for leisure and recreation that will not continue to stress the same muscles / tendons (i.e. if you're keying on the computer all day, hanging out on the internet at night, or knitting / crocheting throughout the evening, this is not providing proper rest for the muscles and tendons that worked all day). Talk to a physiotherapist - RSI can be prevented, but if symptoms do occur, early intervention is the best form of treatment. If you are experiencing regular or increasing discomfort while sitting at your computer, take early corrective action. A physiotherapist will listen to your symptoms and assess you to help provide appropriate treatment, including information about correct posture and positioning at your workstation. They will also work towards an earlier return to your daily lifestyle as well as provide guidance on how to prevent recurrence of injury. Physiotherapists are university educated healthcare professionals who assist people of all ages and lifestyles to gain and maintain their desired level of active living and physical functioning. With their applied knowledge and understanding of the human body in action, physiotherapists are able to help you to increase mobility, relieve pain, build strength, and improve balance and cardiovascular function. 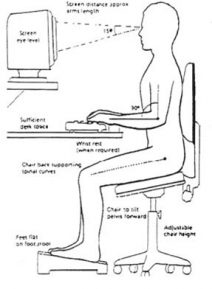 With proper precautions, correct posture and balance of computer work and active lifestyle, you will be able to avoid many of the aches and pains often associated with extended computer work. Copyright (2016) Altima Physiotherapy. All rights reserved.